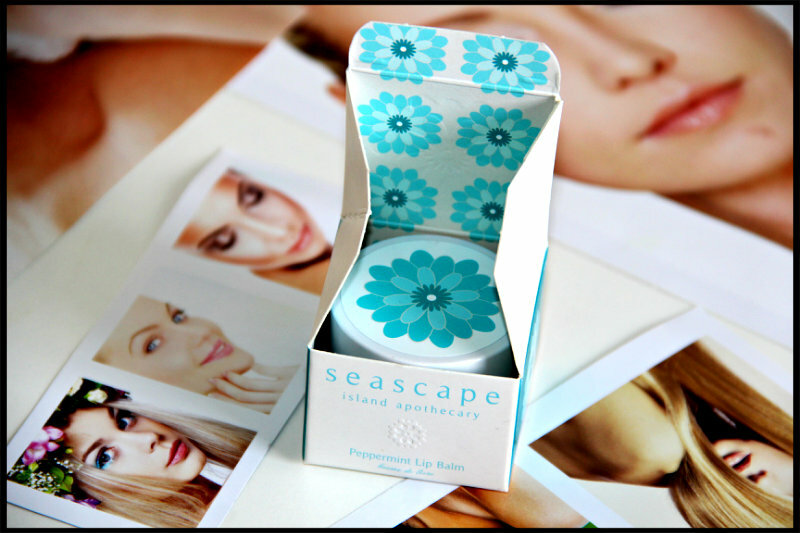 Today I am going to review Seascape Peppermint Lip Balm which I have been sent very kindly to try and review on my blog. I always carry lip balm in my handbag. I can not live without a lip balm. 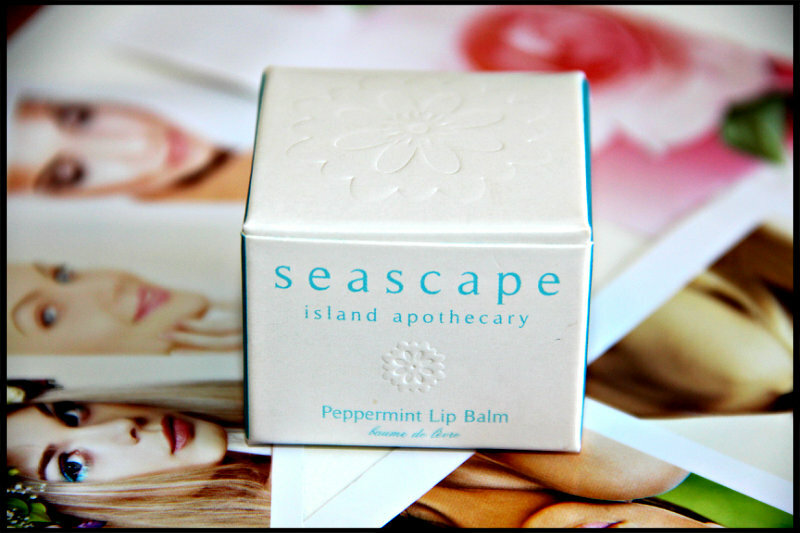 Seascape Peppermint Lip Balm is the latest welcome addition to my lip balm family. I have a huge range of lip balms in my collection as I am so obsessed with lip balms. Seascape Peppermint Lip Balm is made with 100% natural Peppermint essential oil with Jersey Beeswax, Jersey Honey and Jojoba Seed Oil to moisturise and protect dry, chapped lips. This lip balm has no parabens, no silicones, no SLS, no petroleum, no artificial colours and no artificial fragrances. I love the cute packaging of this lip balm so much, it comes in small 10ml glass tub which costs £10.00. I especially like the box which is embossed with flowers and the pretty floral pattern on the inside. 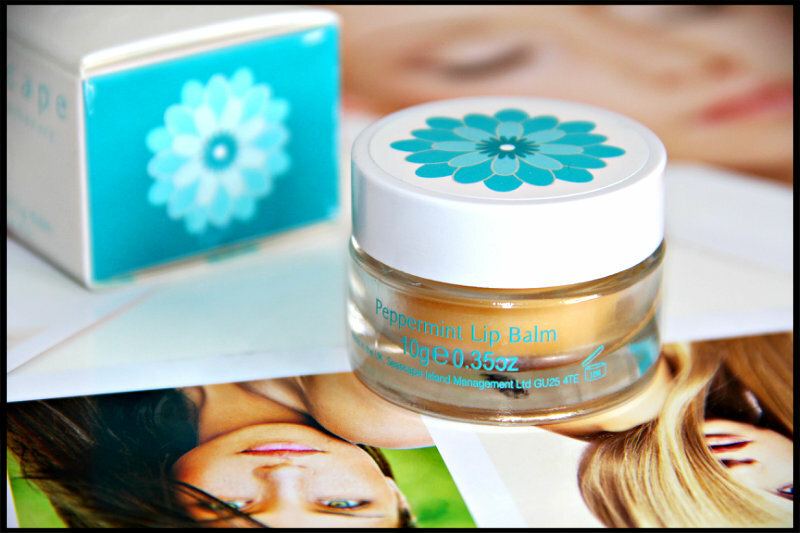 I love the blue floral design on the lid and glass tub gives expensive touch to this lip balm. Generally I prefer lip balm in tube or stick form. This lip balm comes in glass tub so you have to wash your hands before you apply to lips. I am a bit of germ freak so this lip balm is not really convenient for me to use on the go and it makes it a little less travel friendly. The formula of this lip balm is quite hard but after rubbing on fingertips it starts to melt slightly. This lip balm is very light and non-sticky. It glides on my lips smoothly. As I said the formula of this lip balm is quite hard so first time it was bit hard to get any product onto my finger. I had to swirl it few times to get some product on my finger to apply. After few uses it is now much easier to take out the product. It has lovely fresh peppermint scent and it is not overpowering at all. I have used few other Peppermint Oil Lip Balms which tingle when applied on lips but this lip balm does not tingle. It leaves my lips feeling smooth and soft. I use this lip balm as a base before I apply lipstick or lipgloss which makes a huge difference it allows lipstick to glide smoothly. I am also using it before going to bed. It is very hydrating and perfect for drier lips that really need shot of moisture. Overall I am really happy with this lip balm and it definitely become my favourites. If you have dried or chapped lips I think you shall give try to Seascape Peppermint Lip Balm as it really moisturise your lips. I know some people just don’t like minty smell but as I said it is not overpowering at all and after 5 minutes or so the smell is gone. 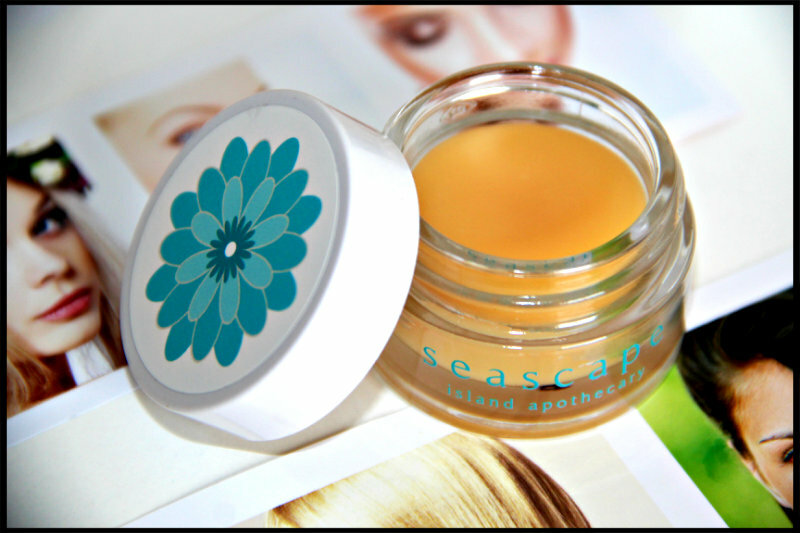 Have you tried any products from Seascape? What’s your favourite lip product for dry lips? You can buy Seascape products directly from there website, here. Today I am going to review one more product of InstaNatural. I have also reviewed InstaNatural Youth Express Eye Gel and InstaNatural Advanced Action Retinol Moisturizer Cream on my blog. I was quite happy with both the products I have tried earlier. 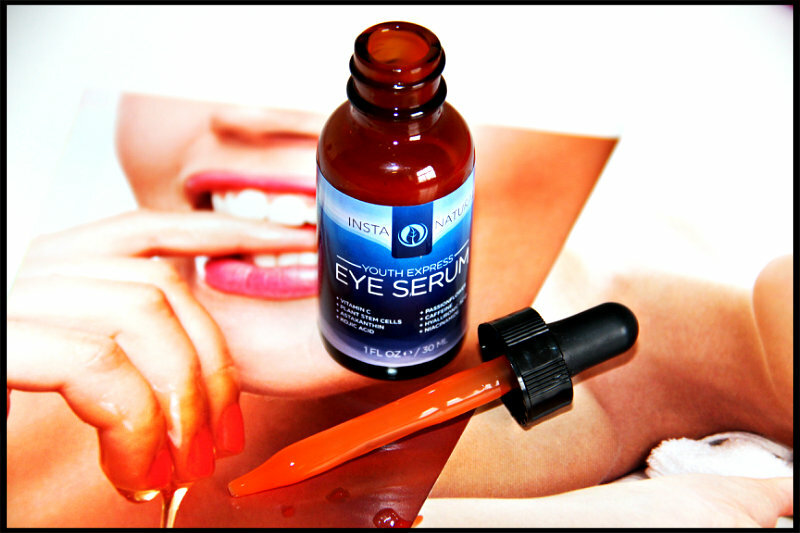 Recently I have been sent InstaNatural Youth Express Eye Serum to try and review on my blog. 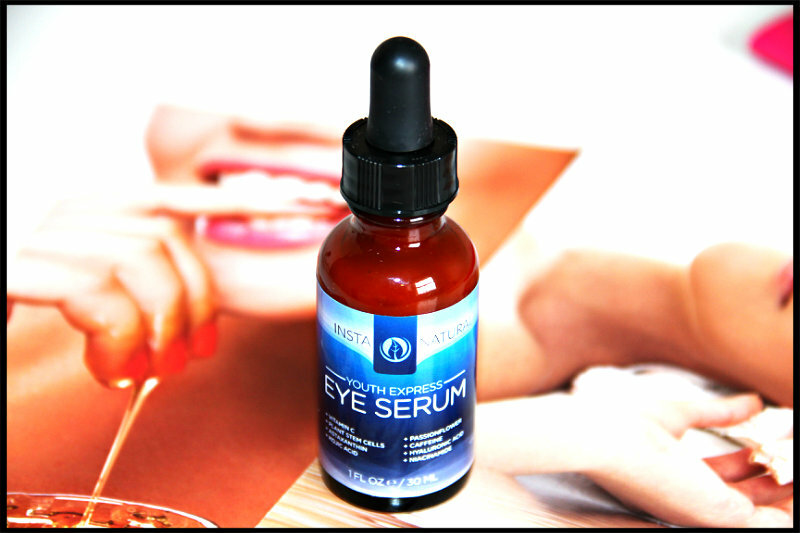 InstaNatural Youth Express Eye Serum is a highly concentrated blend of invigorating ingredients designed to restore a youthful appearance to the eye area. Their serum contains an advanced Peptide Complex – along with Plant Stem Cells, Matrixyl 3000, Astaxanthin, Kojic Acid, Caffeine, Passionflower, and Vitamins C and E – which help to deliver exceptional results to the under eye area, resulting in a decreased appearance of wrinkles, fine lines, dark circles and puffiness. It does not contain paraben, sulphated or alchohol. 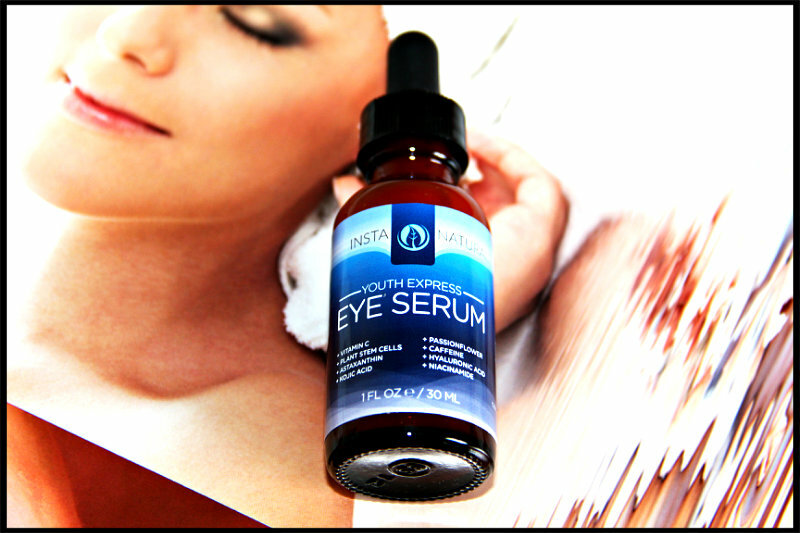 InstaNatural Youth Express Eye Serum coms in a 30 ml glass bottle with a dropper. It is really easy to dispense the serum from jar with dropper and more hygienic also. The colour of the serum is dark, blood orange and I have never used or seen any product with this much dark colour. The consistency of the serum is quite thick and it has very nice subtle orange scent. I really loving the smell and feel like to put serum over and over. Sometimes in morning my eyes are bit puffy and it takes some time to get back to the normal. This happens when I don’t get enough sleep in night or when I am really tired. I do have dark circles too under my eyes. I am using this serum at night before going to bed. You just need 1 drop to apply under your eyes so this serum going to last very long. Apply a small amount of serum to your fingertips and gently press the serum under each eye from the inner corner to outer corner. Use rolling motions of your fingers to press the serum into your skin. You can use this serum daily in morning and night. It is very light and does not have greasy feeling. Once applied it quickly gets absorbed. And yes dark orange colour spreads on clear. This serum did not irritate my skin or my eyes so that’s great! As I said I do have dark circles too and after using this serum for few weeks I see my under eyes area look more brighter. And it also helps me to abate the puffiness. It also claims to treat wrinkles but this would be something you may/may not notice over time. If your main concern is Dark Circles, I think that this serum would be a great choice in reducing the appearance of dark circles. 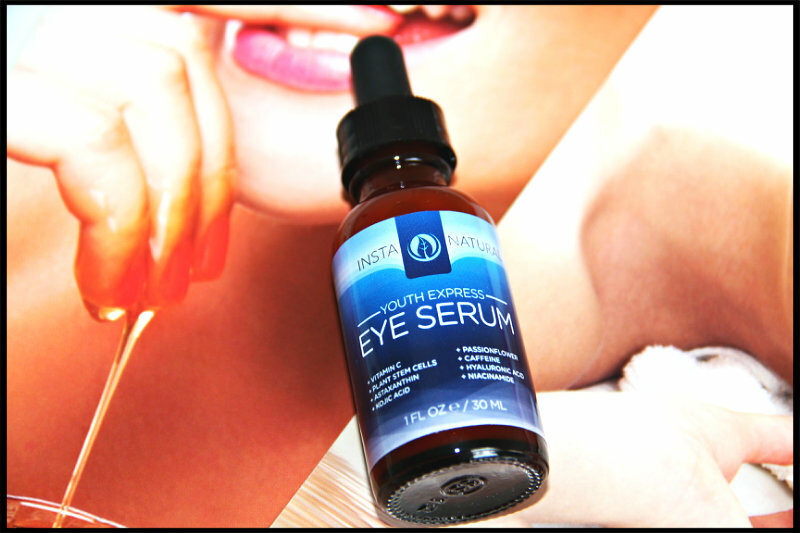 You can buy InstaNatural Youth Express Eye Serum from Amazon, here. 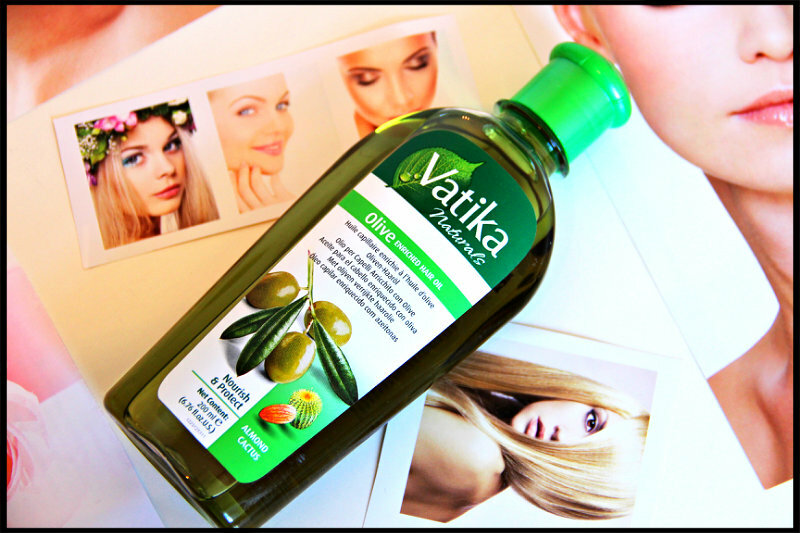 Today I am going to review Dabur Vatika Enriched Olive Hair Oil which I have been sent to try and review on my blog. Olive Oil is famous for long and lustrous hairs. I have used other Dabur products and they all were amazing. As you may know that I put hair oil before I shampoo my hairs as it makes your hairs more soft and silky and it even nourish your hairs. Dabur Vatika Enriched Olive Hair Oil contains all the goodness of olive, almond and cactus, the oil balances moisture and protein content resulting in stronger, healthier hair. 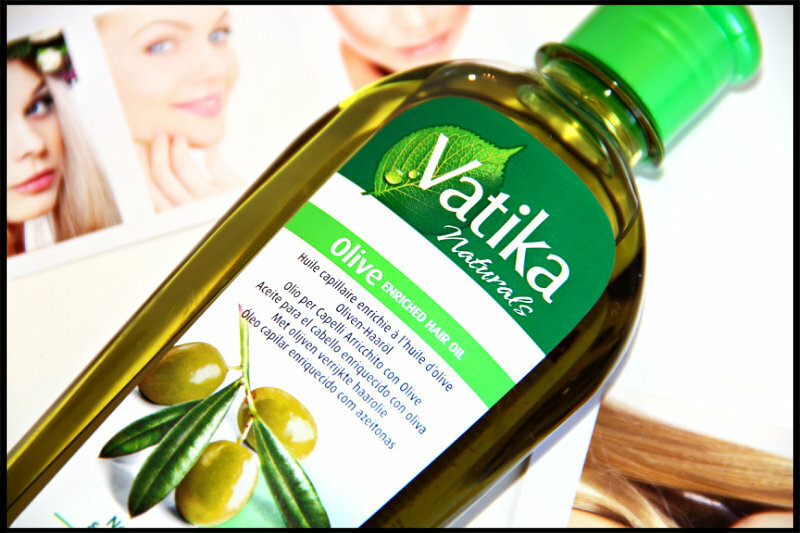 A few drops of Vatika Olive Enriched Hair Oil applied to the hair before washing will infuse moisture directly into the scalp and hair shaft. Dabur Vatika Enriched Olive Hair Oil comes in a see through plastic bottle with a green colored cap which retails for £4.49. The cap locks tightly so you don’t have to worry about any leakage but still it is safe to carry the bottle in a plastic bag sealed at the top. This hair oil has a wide mouth which makes it difficult to control the amount of oil to be dispensed. It must have flip-top cap which makes it easy to use. The colour of this oil is dark green and it smells pleasantly of olives. I am loving the smell of this hair oil so much. Those with sensitive nose might find it little too much! The consistency of this oil is runny and feels so light on my hairs. It makes my hair soft, shiny and healthy. I have tried many hair oils and some of them really gave me very good results. I don’t like thick and greasy hairs oils. This hair oil is just perfect. I am loving it. Me and my hubby both using this hair oil every alternative days before going to bed, keep it overnight and then next morning wash your hairs with luke warm water. My hairs feel so so soft and nourished. During winter I love to put bit warm oil on my hairs and massage them with finger tips. I take some amount of hair oil in bowl and put it in microwave for few seconds and then with cotton pad apply it to your hairs and scalp. I just love doing this as it takes away all stress and gives strength to the roots. Just try ones and you will know the feeling. This hair oil might prevent your hair fall also, I don’t have hair fall problem so I cannot give any surety but few of my friends in India have been using this hair oil and according to them it helped in controlling hair fall to some extent! If you have a major hair fall issue, this might save few of your strands. Overall, I loved this hair oil as it helps to nourish my hair and it has amazing ingredients which makes it a must use hair oil. 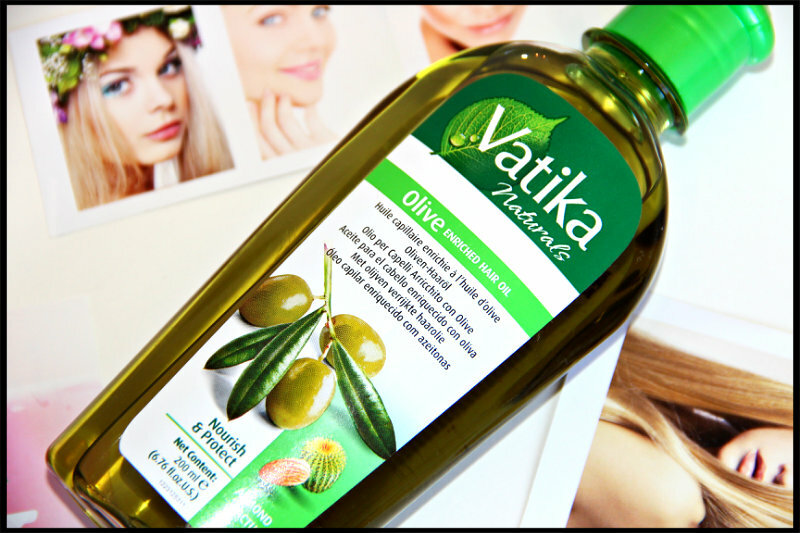 Have you tried Dabur Vatika Enriched Olive Hair Oil or Any other Vatika hair oil? 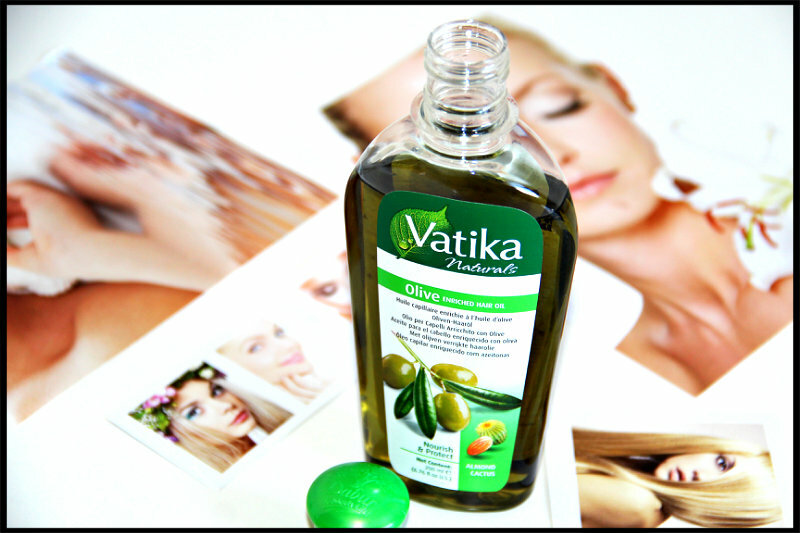 You can buy Dabur Vatika Enriched Olive Hair Oil from Amazon and Superdrug stores. Today I am going to review one more product from A Passion For Natural Aloe Vera Gel which I have been sent very kindly to try and review on my blog. 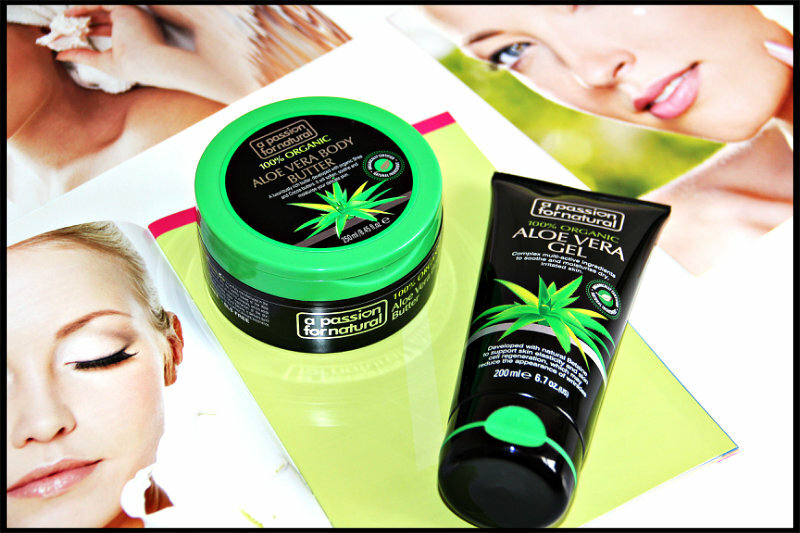 In my previous posts I have reviewed Aloe Vera Body Butter which you can find here. A Passion for Natural their 100% organic aloe vera range is made from only the finest ingredients like Aloe Vera, Betaine, Shea Butter, Beeswax, Jojoba Oil, Grapeseed Oil, Cocoa Butter, Walnut Shell, Seaweed Etract. Their products do not contain paraben and SLS free. 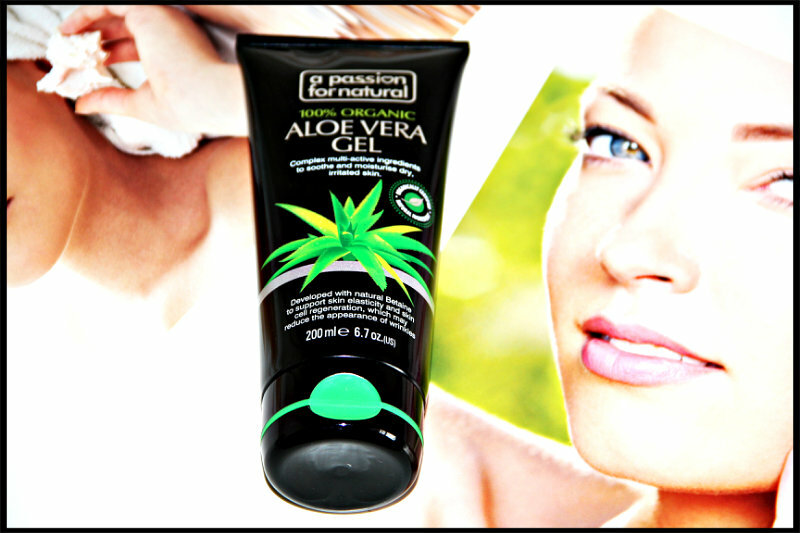 Aloe Vera Gel is a soft, hydrating gel for instant cooling relief to dry, irritated areas of skin. It is made with the finest, most pure, 100% organic Aloe Vera. 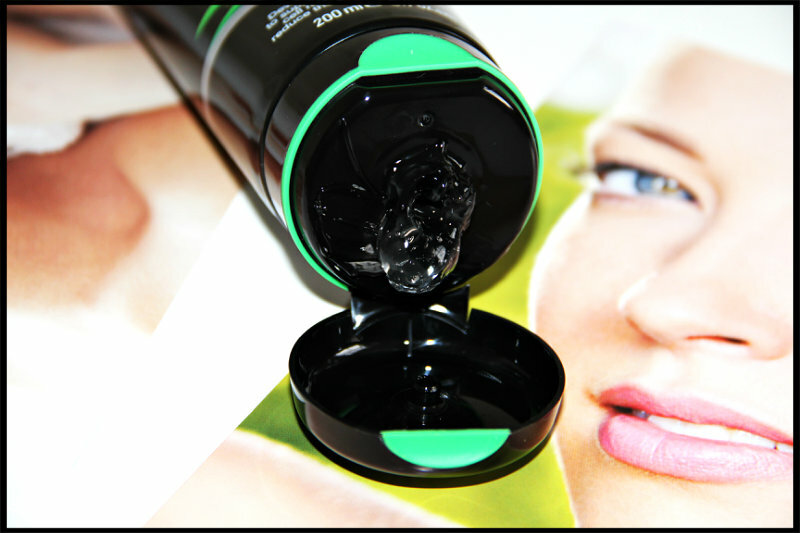 Aloe Vera Gel comes in a simple yet sleek black tube. The texture of this gel is like jelly and it is a clear gel. It has a very very slight aloe vera scent. Aloe Vera Gel is multi tasking as you can use it to cool sunburn, hydrate your dry skin, sooth irritated skin and it is also suitable for sensitive skin.This gel is very handy and you can easily carry it in your handbag. This gel claim to hydrate dry skin patches so I have using it on my entire face as I have bit dry skin and sometimes I see dry patches over my cheeks and forehead. After using this gel for few days I have found that my skin looked a lot healthier and I can see a bit glow on my face. This gel absorbs nicely into my skin and moisturises my dry skin. It does not leave that sticky feeling on skin after application. You can use this Aloe Vera Gel anywhere on your body where you feel dry to moisturise your skin. As you may know my skin is bit sensitive so after waxing legs and hands my skin gets bit red and irritated, I applied this gel to my hands and legs and it was really soothing and soon the irritation was gone. I am going to use this gel more after hair removal and as it says you can also use it to cool sunburn so I am going to try and test it after sunburn. 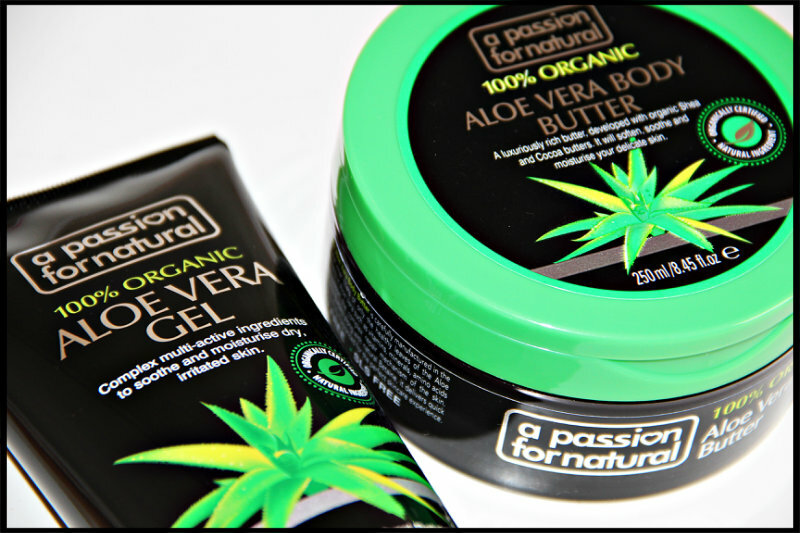 Overall I really enjoyed using both the products from Passion For Natural Aloe Vera range and both works really well if you have dry and sensitive skin. You can buy A Passion For Natural products directly from their website here. This products also available in Boots 3 for 2. 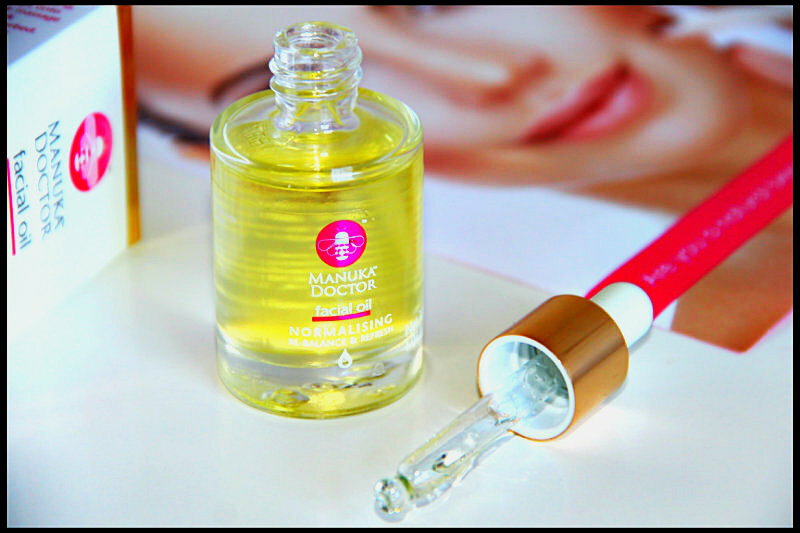 Today I am going to review Manuka Doctor Normalising Facial Oil that I have been sent very kindly to try and review on my blog. This month I have been using facial oils for my skin care routine and I just loving them. In last week I have reviewed Bio-Oil and I was quite impressed with it. This facial oil hydrates and brightens skin. The Normalising Manuka Facial Oil is a balancing formula rich in powerful plant extracts designed to help reduce sebum and refine skin’s texture. Manuka Doctor Normalising Facial Oil comes in a 30ml glass jar with a dropper. It retails for only £19.99 which I think very good price for such a lovely product. It is always very easy and mess free way to dispense the oil from jar with dropper. This product is beautifully packaged and looks pretty sitting on my dresser. This oil contains rich ingredients like Argan Oil, Rose Hip Seed Oil, Jojoba Seed Oil, Grape Seed Oil, and many more. These all deeply nourish and protect the skin. 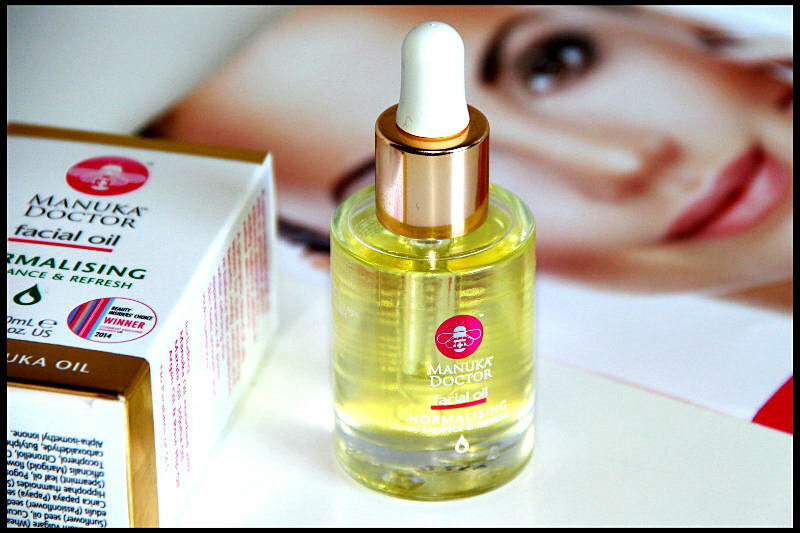 Manuka Doctor Normalising Facial Oil helps to achieve a brighter, fresher and youthful looking complexion. The hero ingredient of this product is Manuka Oil. A synergistic blend of oils known for their soothing benefits refresh and re-balance the complexion, whilst refining the appearance of pores.­­­ Manuka Doctor Normalising Facial Oil is designed to suit all skin types, so there is no reason not to try this powerful anti-ager for visible skincare results. Just a couple of drops applied daily will visibly hydrate, revitalise and even skin tone whilst essential oils restore skin’s suppleness – all without greasy side effects. As I said in my many of the post that I do have combination skin and it is more on dry side. Sometimes I see dry patches over my cheeks and forehead. So I have been using this facial oil on my entire face daily morning after bath. This oil refresh, re-balance and refine the skin. This oil is extremely light and absorbs into the skin fairly quickly. It is not greasy at all. I have also used this oil at night before I go to bed and when I wake up in the morning I don’t see any dry patches on my cheeks or forehead and my skin tone looks brighter, fresh and more even. Manuka Doctor Normalising Facial Oil is very easy to apply, dispense a few drips onto your fingertips and gently massage into the face, neck and décolletage until absorbed. You can use it alone or under your day/night cream. You can also add few drops of this oil into your daily cream and then apply on your face. I have been using it alone but I will also try to use it with my creams. I am not liking the smell of this, but it is not bothering me either. It does not last when on the skin so after a couple of minutes I don’t really notice it. I am loving this oil as I can see the benefits of it for my dry skin especially on my forehead and cheeks. 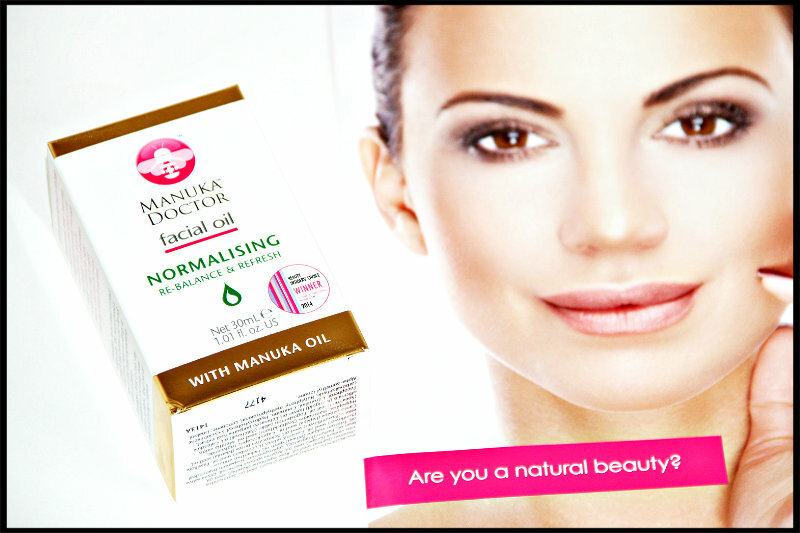 Have you tried Manuka Doctor Normalising Facial Oil? 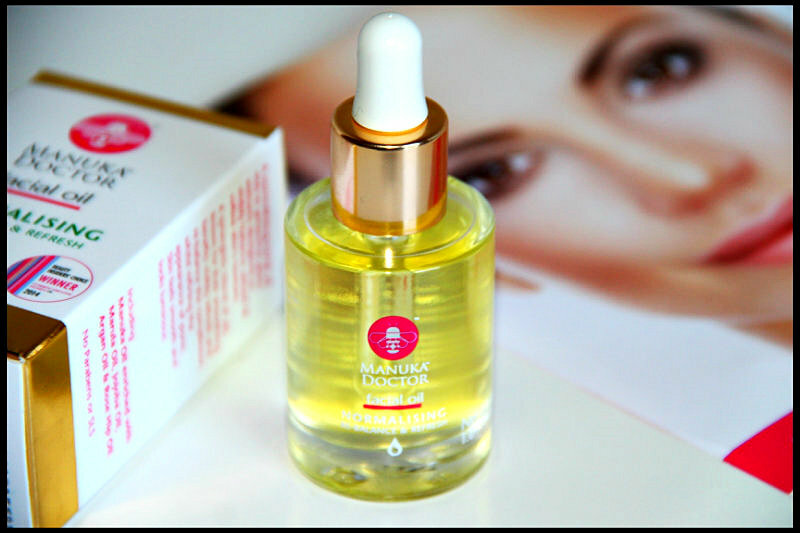 Have you got the best results with Manuka Doctor Normalising Facial Oil? Have you used any products from Manuka Doctor? Please share your thoughts in comment, I would love to know. You can buy Manuka Doctor Skincare Products directly from their website, here.